"I just want to put a HUGE shout-out to Friends of Kids With Cancer!!! This organization is absolutely awesome! This is my son, Gram. He was diagnosed three years ago on February 10 with leukemia at the age of five. He is in his last five months of treatments, amen! As you can see, his shirt says Crushing Cancer. These are his shirts we had made as his fundraiser. 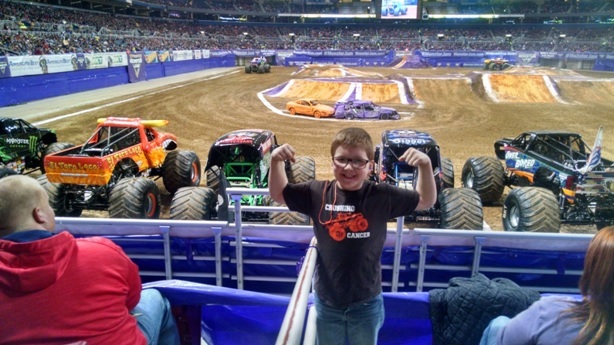 We used the monster truck because this is something he has loved since he was about four. We have never been able to actually take him to see the real thing, he has only seen them on TV. His room is decorated with the monster trucks and everything. 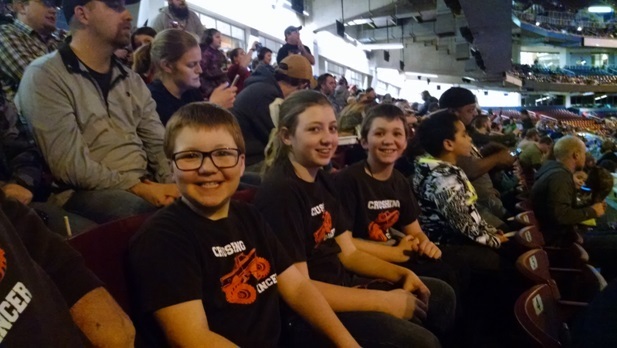 Because of the Friends of Kids organization we were able to not only take him but his two siblings to Monster Jam last night. I haven't seen him so excited about anything in a long while. Thank you SO much for making this boy's dream a reality! God bless everyone who helps make this organization possible; it means so much to our family."